The Democratic National Committee launched its new iPad app Thursday. 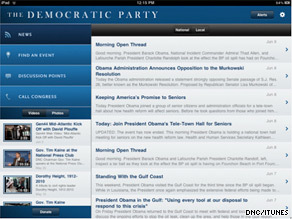 Washington (CNN) - Late Wednesday night the Democratic National Committee launched the first mobile application from a political party designed specifically for the iPad. The new app's release also coincides with Thursday's release of the new iPhone 4. Features on the free app, which can also be downloaded for the iPhone and the iPod Touch, include a new platform "AirMail" which allows the DNC to send messages to users to take action. Users can also access an events tool, watch videos, see pictures, read Democratic discussion talking points and receive news alerts. Users will also be able to call their member of Congress from the application, donate to the Democratic Party and post content to Twitter and Facebook. "We think it is a really comprehensive way communicate with our network of grassroots activists," DNC spokesperson Brandi Hoffine told CNN. "This is just the beginning of our mobile technology effort and we're excited to show off other features this year." While the DNC is the first political party to launch an iPad friendly app, the White House was ready with its iPad app the day the new Apple device launched. The DNC, hoping to capitalize on buzz as the new iPhone hits shelves, also launched a similar app for Organizing for America, the grassroots organization of Obama supporters brought together during the 2008 White House race. This electronic crap is what got us into this mess to start with. Look what got elected because of it. Sheep following electric orders from their masters. What's truly amazing about this article is not the technology, but two things; the fact that it cites, "....so users can take action..." rings of ACORN and voter fraud....and the other item is the fact that OBama still has supporters. Wouldn't surprise me if the DNC doesn't ask the government to subsidize it's voter base to allow them to buy iPads...that way, it'll be "fair.."
No move that the dems do is going to save them this time. Remember folks what this slime called congress did to you and I.
Wreckless spending, Forced Health Care (and making you pay for abortion. Don't be fooled over the Obama executive order because it does not mean squat. A President can not override legislation with an executive order.) The blatant attack on family and marriage by telling you that you should accept homosexuality, The attack on US sovereignty. (You know what they were doing on Memorial Day? Instead of celebrating the men and women who have sacrificed their livesfor our freedom in this country, they were over at a meeting in a foreign nation discussing the US joining the ICC. Thats right!) They think you and I are stupid enough to believe their story. This socialist government has attacked our freedoms by taking over the US economy and using your financial situation to advance their own agenda in behind your back, They have slipped in provisions that they never told you about in war funding bills etc. Remember all of this when you vote. Don't be fooled by these liars who want to continue to wreck our nation and drive our debt even further. VOTE CONGRESS OUT in 2010!!! I love my iPad! Get on board, the train to the future is leaving the station. Perhaps the DNC can use the App to explain why they and Obozo are supporting an Internet Kill-Switch. Seems like liberals are learning a lot from their friends in Iran and North Korea.